We are so close to the finish line with the kitchen.....it's just teasing me with its unwired cookers and unplumbed dishwasher! I'm moving back within the next few days and there will be worktops by the end of next week so we can start to get back to some form of normality again. Oh and talking of normality being restored, my new wardrobe arrives today!!! WHOO HOOO! I can finally get all my clothes out of boxes...and hang up some of my recent purchases. 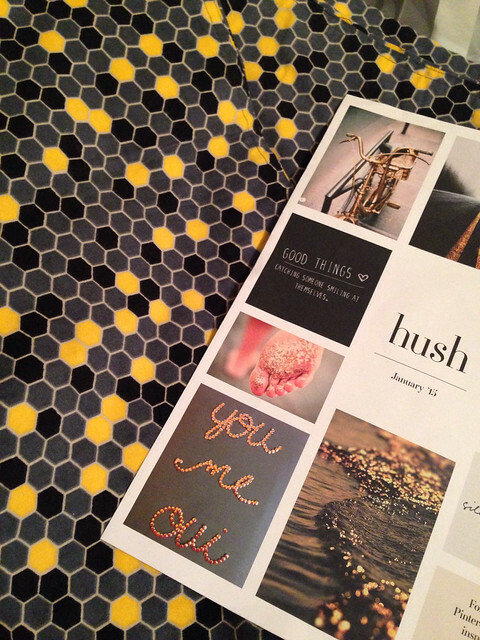 Because living at your mother in law's with 3 kids and no husband and a bad back = shopping therapy......first up, Hush. Following on from my last blog post, I ordered twice from the sale and kept half of what I got in the end. 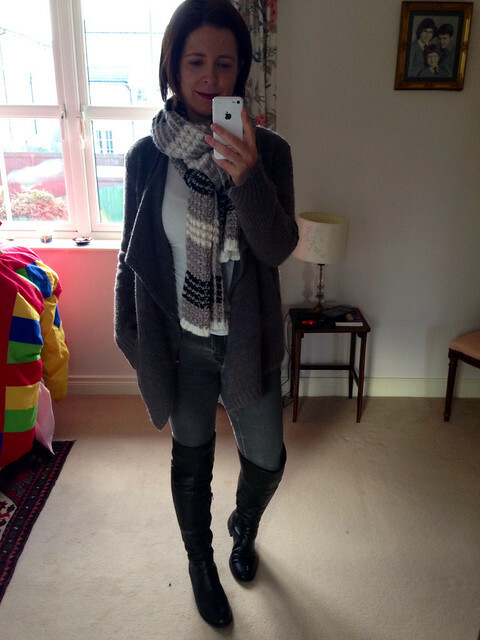 My back wasn't strong enough to do a proper try on post - but I kept the V-Neck jumper and Scarf from this photo. The cardigan is a no brainer for £25 really. It's just a great piece of loungewear as well as a fab coatigan style for when the weather warms up a little and you don't need a coat. The scarf has great colours and is cosy but the tassels annoyed me so I took them off...they were just looped on and super easy to remove. For info, all the Hush sale stock is being removed from the site on Sunday night and until then, you can get a further 10% off (sale and current stock) using SPRING15. Sold out items have been coming back into stock occasionally over the past few days as returns are processed so do keep an eye on anything you fancy over the next 2-3 days - you never know your luck. Next up, Mango. I ordered from them about 3 weeks ago and I'll be honest and say that I'd forgotten what I ordered by the time the dispatch email arrived. It baffles me why some companies can send items out within days and for others like Mango and H&M (i.e.massive retailers) seem to have such logistic issues with online orders. Anyway, after watching the slow progress on the DHL site from Madrid to Belfast, it finally arrived, minus one item (refunded) but the good news is that everything else in the delivery was perfect and will be kept. And in fact if it hadn't have been, there was a 48hour free return post label. So I have to wait 3 weeks for my delivery but it can all be returned to them within 2 days? <sceptical face> but let's focus on the order success...all good things are worth waiting for, no? 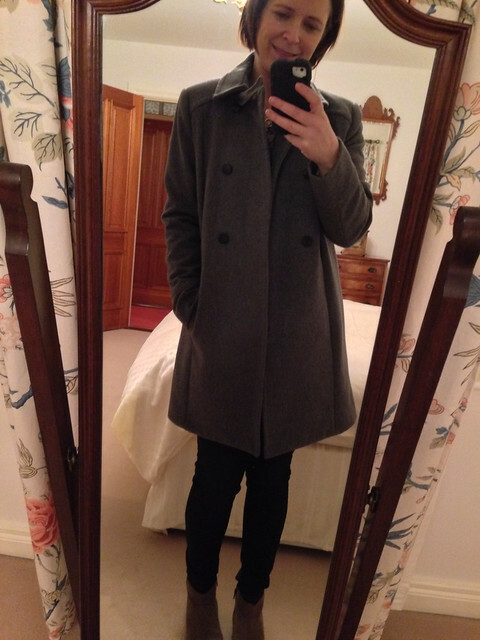 First up, I've been looking for a grey wool coat since the sales started and just couldn't find the exact shade of grey (there are 50 after all I'm told) for the right price. But this one looked like it would tick most of my boxes and I'm really pleased with it. Sadly sold out in the grey now but is available in black on this link in limited sizes (I ordered a M which is about a 10-12 in Mango) and it fits me perfectly, being more of a 10 on top. I liked the sound of the coated skinny jeans in blue and have had good success with Mango skinnies in the past. The ones I ordered are a perfect fit for me in the 12/40. They do feel quite strange to the touch, almost rubbery but not shiny, and on the inside they're the softest blue denim so they are really comfy to wear. 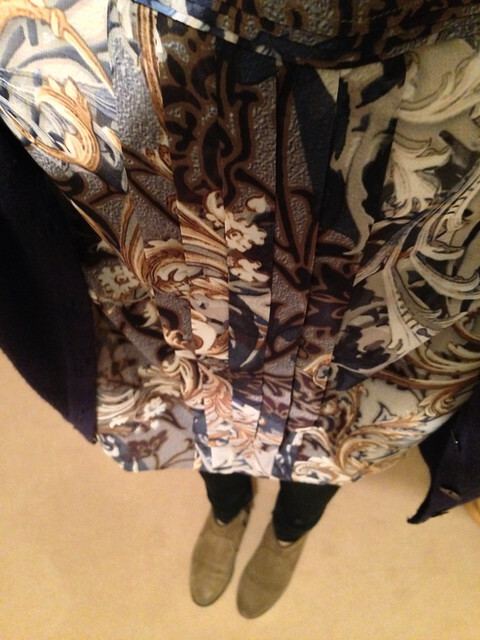 Just on a whim, I also ordered a blouse with a print including grey, navy and camel and a plain navy lightweight scarf. Both are great - the latter will suit more in spring or summer so I'm not wearing here but the blouse is perfect now with my Mary Portas cardigan as worn today. Photos don't really show these items off that well - apologies but in any case, they're not on the Mango site anymore. 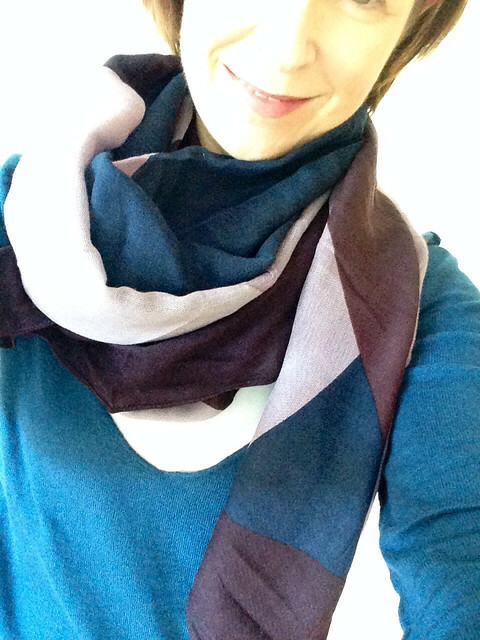 Lastly, a sneaky £11 Benetton purchase (from the Lisburn Road store). 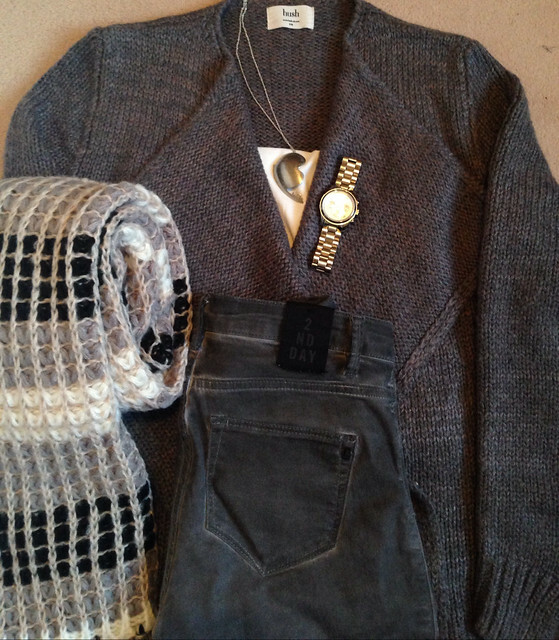 A wool mix, slightly oversized camel v-neck jumper. Total classic item and lovely quality. 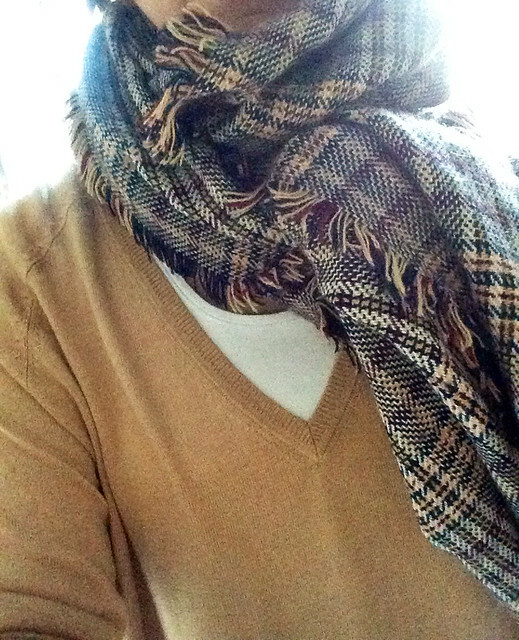 Worn here with an ancient Zara scarf from the Mens department. 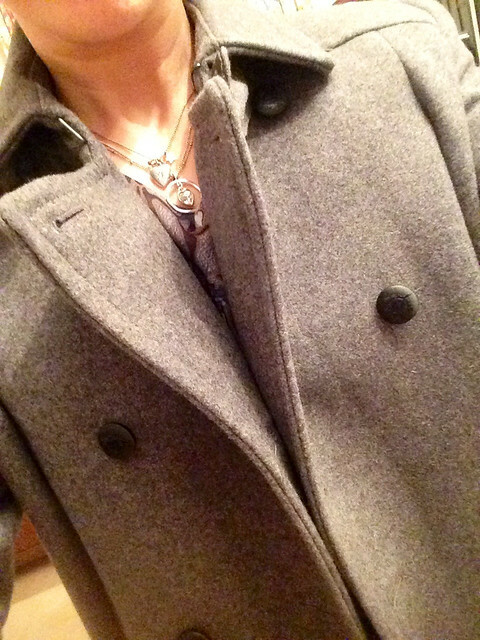 Still lots of knitwear and warm coats left in-store for you local girls. If you're wishing you bought a real down puffa this winter, they're so well reduced right now with lots of different lengths and styles available. Oh and the kids's sale is brilliant as well. Right - half-term (and new wardrobe)...let's be having you! Good to have you back. Love the colour of the Benneton jumper. Hope the move back in goes well, and looking forward to - hopefully - seeing some more regular posts from you! I bet Hush don't have any returns of the Hush Goldie 2 jumper in the grey. I shrunk mine :( by accident. It will resume it's new life as a cushion cover when I get round to it. And I honestly believe that shopping therapy does not get the credit it deserves - I always feel much better after it. 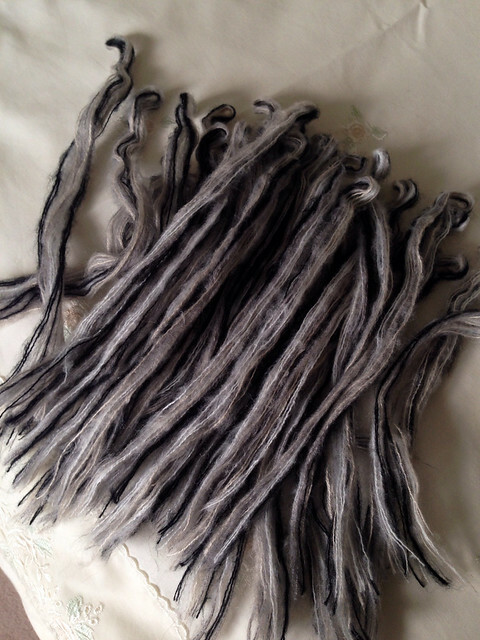 You have some lovely pics here - I love the fact that you took the tassels off the scarf - it's the kind of thing I do! Welcome back to the world of blogging! LOVE that camel vneck sweater by the way. Also adore the burgundy and teal combo. 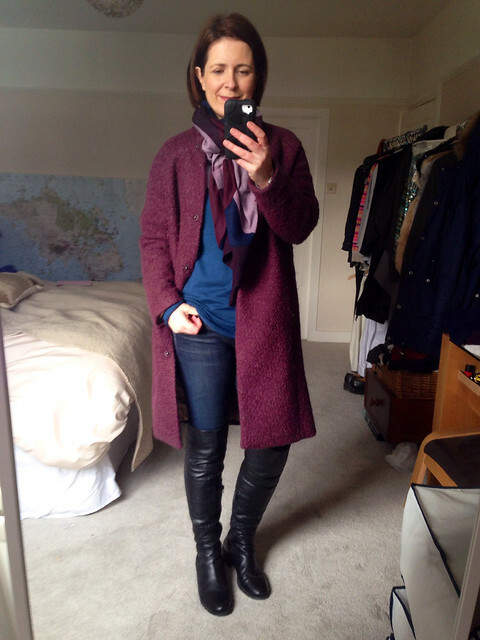 Love your over the knee boots - do they stay up and are they fitted or baggy around the ankle? I am very tempted ... would love the Russell and Bromley 50/50 ones but not at the asking price! The boots have been amazing - they stay up really well - I don't have to pull them at all during the day. No bagging at the ankle - a little bit of creasing as per other long boots I've had. Elastic boots will give you the best fit for sure but I've found them less comfy to wear with jeans as the can be too tight on the seams and rub quite a bit, esp around the ankle. It's one of the reasons I don't wear my hobbs elastic ones as much! Thank you! I have a birthday coming up so may use some of my birthday money towards them! I adore hush clothing. The sales are fab! Am just drooling over the new seasons stock now.